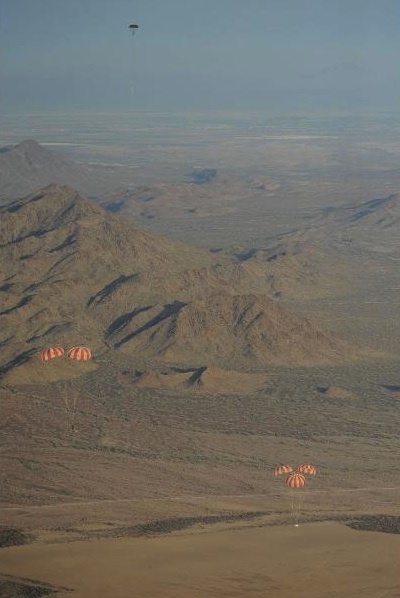 NASA continued testing the Orion capsule's recovery chutes last week in a high-altitude drop from a U.S. Air Force cargo plane ahead of the craft's first orbital test flight in early 2014. 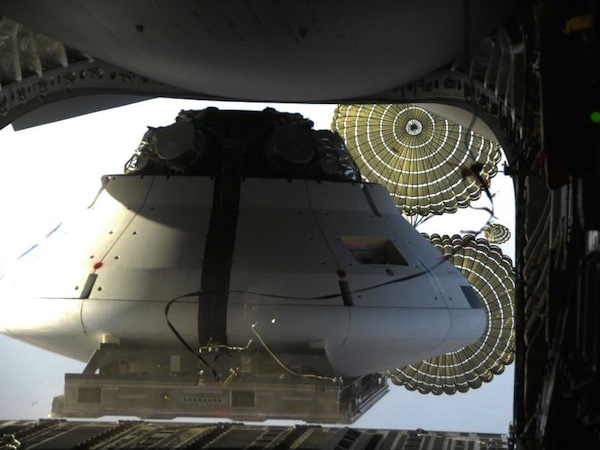 A mock-up of the Orion spacecraft was dropped from a C-17 cargo plane 25,000 feet over the Yuma Proving Ground in Arizona. 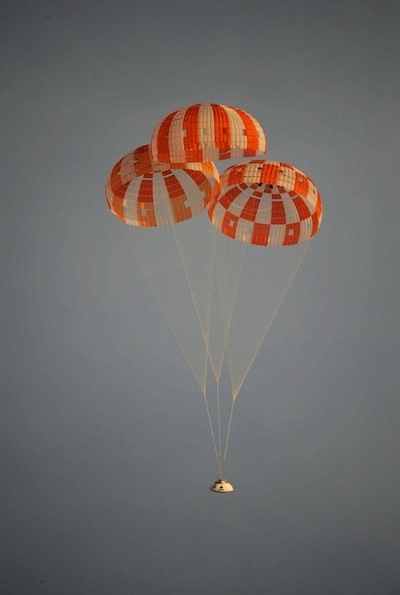 The Orion's drogue parachutes were deployed between 15,000 and 20,000 feet, followed by the release of pilot chutes, which pulled the craft's three main parachutes from their canisters, according to NASA. 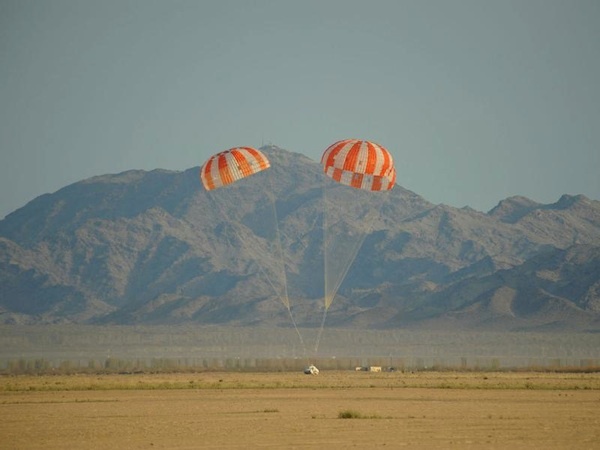 It was the first drop of an Orion parachute test vehicle since 2008, when a first-generation mock-up crashed to the ground after a faulty separation from a carrier pallet following its release from the C-17 cargo plane. 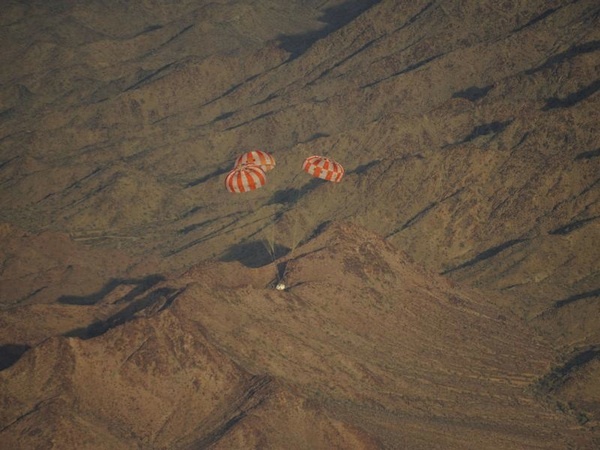 The Feb. 29 drop used a second-generation test capsule after modifications to the programmer parachute deployment bag, NASA said. Orion landed at a speed of 17 mph, well below the spacecraft's maximum allowable touchdown speed, a NASA statement said. 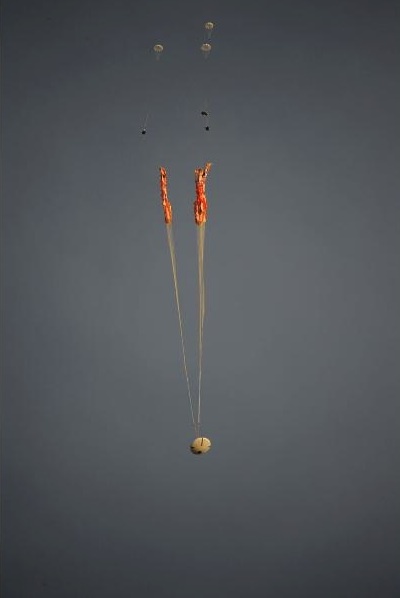 "The test examined how Orion's wake, the disturbance of the air flow behind the vehicle, would affect the performance of the parachute system," NASA said in a statement on its website. "Parachutes perform optimally in smooth air that allows proper lift. A wake of choppy air can reduce parachute inflation. The test was the first to create a wake mimicking the full-size Orion vehicle and complete system." 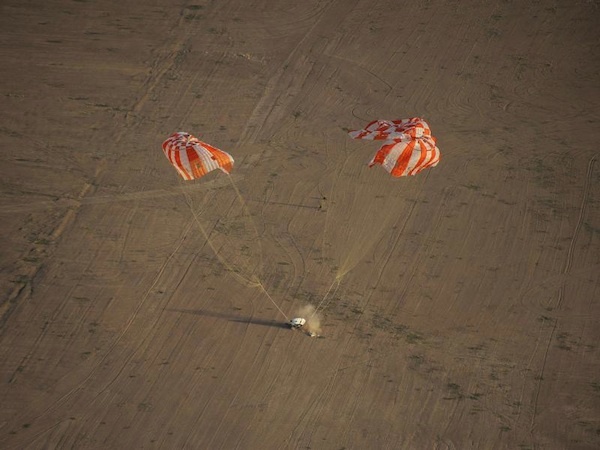 The Feb. 29 test was another in a series of drops to ensure the Orion's recovery system is safe. Josh Byerly, a NASA spokesperson, said four more drop tests are planned in 2012. 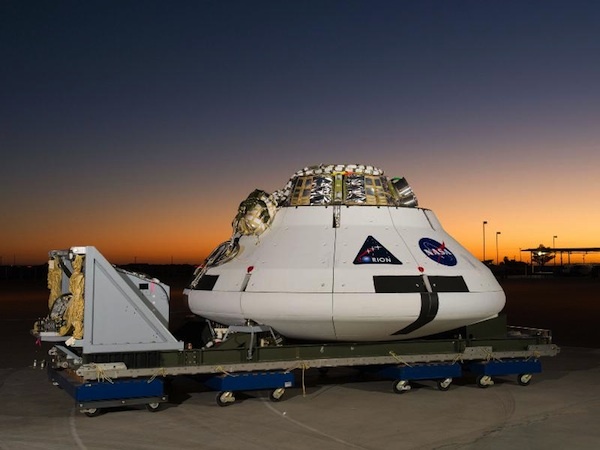 Two will use a full Orion mock-up like the Feb. 29 test, and two other drops will use a parachute compartment drop test vehicle, a test article which mimics the Orion spacecraft. NASA has scheduled an orbital test flight of the Orion spacecraft for early 2014, in which engineers will verify the performance of the capsule's heat shield at re-entry speeds matching the velocity of an Orion returning to Earth from deep space.